A friend asked me to participate in the latest Facebook thing which is “tell us (some number) fun facts about your pregnancy/adoption.” I tossed off a few things thinking nothing of it, and had a huge response. So, I’m posting them here as well. It occurs to me they give a bit of context about how this all came to be. And, we’re snowed in, so there’s not much else to do. Before I became a foster parent, I explored having kids biologically. Shopping for sperm online weirded me out, and it takes quite a bit to weird me out. A friend who had worked for my state’s Department of Human Services suggested fostering before I adopted. God bless her, because I wouldn’t have thought of it otherwise. 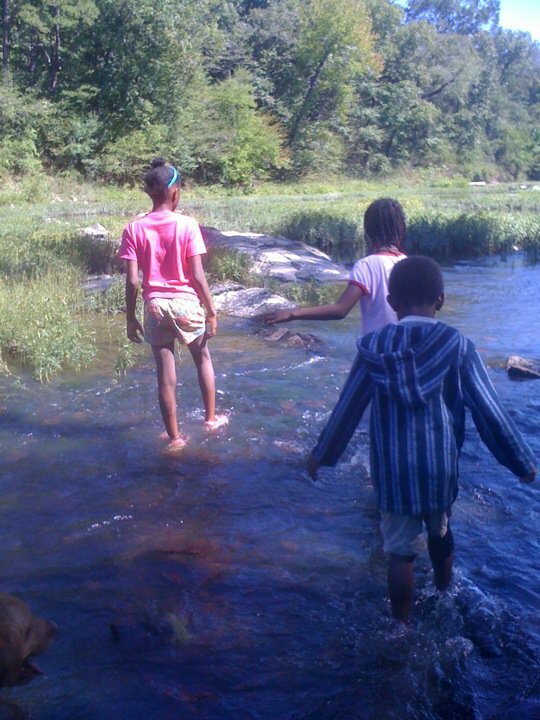 My adopted kids were my first foster kiddos. It’s pretty unusual for a new foster parent to be able to adopt her very first foster placement. About 70% of foster kids in Oklahoma (my state) are returned to their biological parents. My girls arrived on the same day in February 2008, and my middle child had so many meltdowns that first day that she was re-classified as a therapeutic foster child and sent to a therapeutic foster home less than 24 hours after arriving at my home. My son arrived in June 2008. I got a call asking me if I’d like the girls’ brother, because his foster home was being closed down due to confirmed abuse. When I couldn’t leave work immediately to pick him up (I was doing a strategy session for 30 people! ), they dropped him at my daycare. The poor baby was three years old and was wearing the only clothes he owned, had no familiar toys, and two shoes that were both left-footed and different sizes. My oldest daughter was at the daycare, but had no idea he was coming. She walked up and re-introduced herself, and he eventually realized she was his sister. That scene in The Blindside where the main character meets his brother in a restaurant? Yeah, that stuff actually happens. I had to get special permission to become a Therapeutic Foster Parent, because I worked outside the home, and Therapeutic Foster Children need more care than your run of the mill foster children, so you’re really supposed to be at home with them when they’re not at school. I completed additional training so that my middle child could come back to my home. We finally got her back July 4, 2009. She’s my little firecracker! My son’s biological dad’s rights were terminated by the time my son arrived at my home, but the kids’ biological mom and the girls’ biological dad went to court to defend their parental rights and requested a jury trial. While we were waiting to pick the jury, the mom’s attorney asked me to speak with the kids’ mom, which I thought was just absurd, because she really hated me and blamed me for her not having her kids. I spent the most focused 1 1/2 hours of my life calmly speaking with her across a conference table with the sheriff’s deputy and her attorney sitting beside her, and afterwards she relinquished her rights in front of the judge. She was worried that the kids would hate her if she relinquished. Among other things I reassured her that I didn’t encourage them to hate her. I explained that we talked about her not being prepared to be a healthy parent and making some really poor choices, but that hating her would not help the kids. That was the only time in my life I have felt God speak through me. (And, no you won’t see me reference God often. When I do, I mean it.) The girls’ dad asked me if he could give the kids to me, after he’d chatted with me on the first day, seen photos, and knew they were happy. I have tremendous respect for the girls’ dad, because he could have easily given up rights since he was in prison, but he fought for their welfare the hardest. My son is named after his biological father (who promptly abandoned him), and he’s not the only kid the biological father named after himself. Thankfully, his first name fits him better than any other name I could come up with, and he’s definitely made it his own. I postponed my wedding and move to a different city, because the adoption took six months longer than the drop dead date that my state’s Department of Human Services gave me. When it finally happened in September 2010, I immediately started job searching, re-planning my wedding, and looking for a house in our new city. I got a job and relocated that following March, and I got married in April. In between, I found out i was pregnant for the first time (at 41!) and miscarried at 10 weeks, a week before my wedding. My middle child was institutionalized for the first time that July. It’s been a big few years. A ridiculous number of people got us to the point we are now. My friend, Jilian, bailed me out when my middle kiddo got kicked out of daycare. She hooked us up at the Boys & Girls Club, which were really the only ones who would take my daughter after she was kicked out for behavior. If not for them, I wouldn’t have been able to keep the kids and keep my job. Lots of other foster/adoptive parents who I met through support groups and who now support me via a Facebook group we’ve created answered lots of questions and kept me from losing my mind. My co-workers gave me a foster parent shower. I have a couple of dear foster/adoptive parent friends who take my “no one in the world but you will understand this” calls. My mom and sister took care of me and my three kids when I had to have emergency surgery. My friend, Laura, is the Executive Director of the Oklahoma Therapeutic Foster Care Association and a consultant nationally, so she’s a huge resource. And, my friend Lori Cain, met us in a snow storm so we could buy the house we live in now, even though she’d never even met me at that point. It takes a village, people. Please feel free to post your own foster/adoption experiences here! I get a lot of “Shelley, I just don’t know how you do it.” Here’s my secret – I don’t. I fail miserably in lots of ways. Don’t get me wrong, I do my job well, I function as a mom, and I don’t drop too many balls overall. I don’t drink excessively, explore dangerous drugs or even eat too poorly. What I do is run out of gas. Yep, over the last year, I have run out of gas at least six times. Once I did it while lecturing to my oldest child about taking responsibility for herself. I also get speeding tickets – three in the last 4 months. Here’s what’s good about that, though, and why I’m writing about it – people are awesome. I’ve said many, many times that it takes a village to raise my kids. Today, it took Reggie, a total stranger, who decided to bring me gas after I stalled in the left turn lane at a very busy intersection during rush hour. This is Reggie. Reggie saw me in the median, directing traffic away from the left turn lane (I really didn’t want to see anyone run into my car or each other), and asked if I needed help. I told him help was on the way and thanked him. What I didn’t know was that he told himself that if when he drove back by if I was still there directing traffic, he was going to get some gas and bring it to me, which he did. This is Reggie’s car. 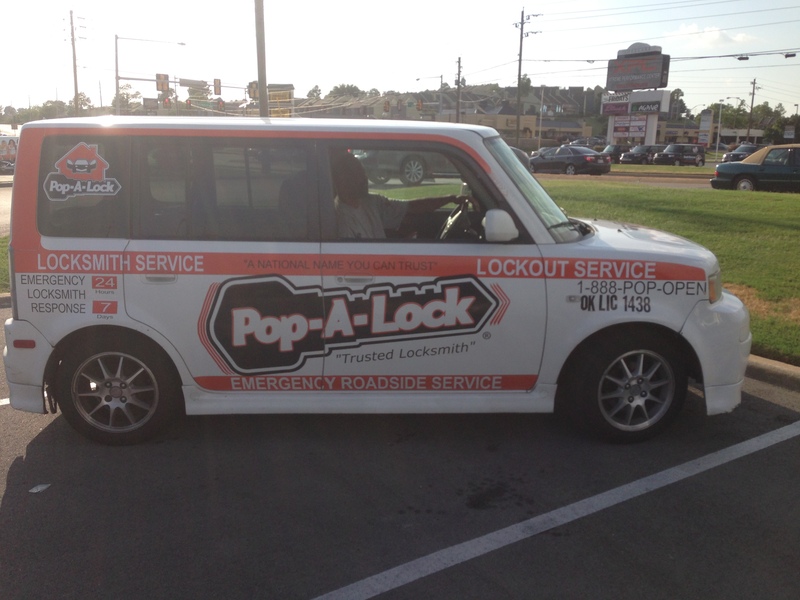 Reggie works for Pop-A-Lock. He was doing a job for them when he saw me. 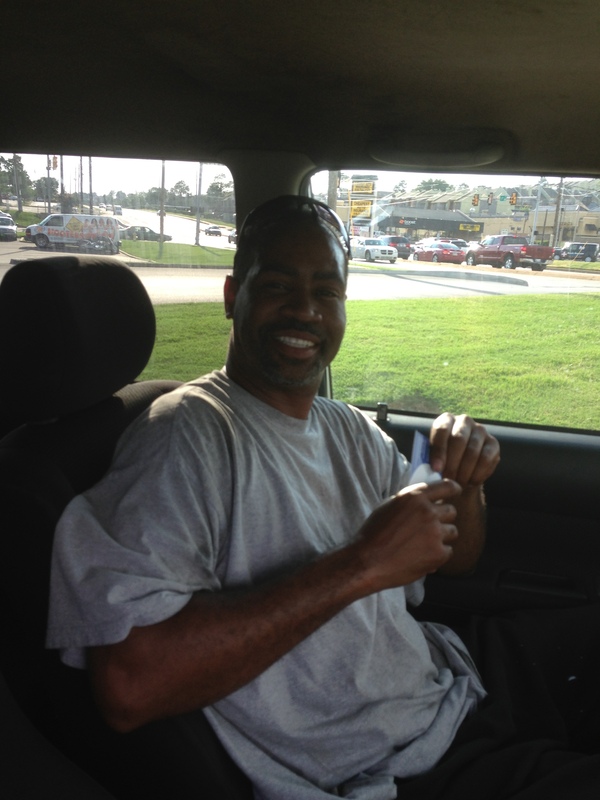 When he delivered my gas it was as a good samaritan. He didn’t charge me. He called me ma’am. He stepped into traffic to put the gas in the car. He was just a ridiculously nice guy doing something good. He doesn’t own the company. He didn’t know I have 1,000 Facebook friends and a decently successful blog. If you care to, you might let Pop-A-Lock know that it was cool what Reggie did. And, can I mention Reggie is black? Considering my last blog post, I think that’s an important thing to mention. Unlike the mature white woman in a Mercedes who wouldn’t look at me while I was trying to tell her that my car was blocking the lane and that she’d have to move (because I was so clearly dressed for car jacking, in my black crepe suit and heels in 103 degree Oklahoma heat) Reggie was awesome. As were the 20 other black men who stopped to ask if I was OK, and did I need help. Honestly, with the current state of affairs, I don’t know that I’d be as nice if I were them, and I think it’s important to acknowledge them. I’d also like to give a shout out to all the other men and women who pulled over to ask if I needed help. And, to the awesome guy who stuck his arm out his window, handed me a cold bottle of water and said “I know you’re hot, honey.” And, to the people who gave me the thumbs up and a wave when they realized why I was standing in the road waving them away. So, I’ve solved my speeding problem by using cruise control in town on my way to work. I’m not sure how to solve my running out of gas problem. The obvious answer is to watch my gas tank, but I think my problem is a bit bigger than that. My stress is clearly manifesting itself in my lack of attention to my gas tank. And, when it gets right down to it, I appreciate the opportunity to gain some perspective about the nature of people. I love Oklahomans. People are awesome. Usually when I write, I try to come up with some kind of lesson, something I’m supposed to learn, some bigger picture reason for why things happen the way they happen. Today, though, I’m just amazingly angry. I just left T, my 10-year-old, at inpatient psychiatric care for the second time since November. It’s her third stay – the first one was a little over a year ago. She arrived at psychiatric care via a police patrol car. The same incredibly kind police officer who showed up at our house last Tuesday (five days ago) called me after she heard our address on her radio today and said “I’m on my way. I heard dispatch give your address, and I said “I know that kid.” I’m coming over.” By the time she arrived, I was drenched in sweat, shaking, afraid I might be having a heart attack, and pushing with all the strength I had left in my legs to keep our attic door closed as T threw her weight against it from the other side, as she screamed and yelled to be let out and kicked holes in it. She hurled her tiny little 10-year-old body like a weapon against the years of abuse and neglect that she suffered and can’t escape, though she’s been safe, loved and cared for for almost four years. That’s where I find myself more and more lately. Sweating, exhausted, terrified and praying to God that my daughter doesn’t get out of wherever I’ve been lucky enough to trap her and accidentally break her neck or throw herself into the covered pool and drown. For years she would at least stay in her room while she was raging, which provided some level of safety. But over the last few months, she leaves her room, roams the house, the yard and our neighborhood if I don’t physically restrain her, which is getting harder and harder. Last Tuesday, with both my husband and I home, she managed to throw her closet door down the stairs, nearly falling down with it, then get out the back door, narrowly miss falling into the covered pool, out the gate, and run down the street wailing hysterically and tearing off her clothes. My husband and I stood in the driveway, knowing if we chased after her it would only get worse. So, we stood, feeling hopeless, doing nothing, hoping the police arrived soon. So, here’s where I have to ask, how in the hell is this as good as it gets for mentally ill children in this country? I read with both horror and relief “Thinking the Unthinkable” by the Anarchist Soccer Mom where she writes “I am sharing this story because I am Adam Lanza’s mother,” and I thought, “yeah, that’s me. Is my kid the next one on the national news?”And I know a lot of other parents who are thinking the same thing. My husband and I both have advanced degrees, we make what is an upper income for the state in which we live, we’re resourceful, and I’m assertive to the point that I’m sure I’ve been called a b*tch more than once. I’ve got a great supportive network, including a wonderful extended family, and I’ve read every book I can find on Reactive Attachment Disorder (her diagnosis). She has therapy weekly, takes medication, sees a good psychiatrist, and is on the waiting list for the Reactive Attachment Disorder (RAD) unit in our community. Though the RAD unit has a good reputation, there aren’t very many beds, and the stay there is a minimum of 6 months, so the beds don’t open up often. There’s not much written about her diagnosis – in fact if you read attachment texts it’s generally not covered. My kids’ therapist has asked to write his doctoral thesis on our family, because both of my girls have RAD diagnoses, and in his words “are not burning down our house nor stabbing us to death in our sleep,” so we must be doing something right. So, basically, I’m the Mrs. Cleaver of the RAD set. I’m the Mrs. Cleaver, and I still can’t help my kid. I’m doing every damn thing I can think of, and I still can not help my kid. In ten days, the psychiatric hospital will likely send T home, because she will no longer be “acute,” – no longer a danger to herself nor others. T can do 10 days in a psych ward like it’s Six Flags. She won’t show any of her defiance. She’ll be a super sweet kiddo, because she’s smart and she knows how the system works, and she wants to be in control. In foster/adoptive circles, we call this the honeymoon. If she didn’t have a RAD diagnosis, she’d be stepped down into residential care once she was no longer acute. But, because she has a RAD diagnosis, the hospital will send her home, because they know they can’t help her in the 90 days or so they could keep her and actually get paid. They know she needs the RAD unit (6 months to 2 years). So, they’ll send her home, and she’ll continue to have rages that require police intervention once a week, with no end in site, and it will traumatize my two other already traumatized children and stress my marriage and slowly but surely destroy our family. And, the best I can hope for is that she doesn’t hurt anyone else. And, this is as good as it gets. Tonight, as I was tucking in my kiddos, my 8-year-old proudly showed me her “libary” books. I said your “what” books? She giggled and said “library books,” smiling broadly. I joked with her that if she left the “r” out often enough, the “r” might get its feeling hurt, go away and never come back. Then “rivers” would be “ivers” and “roses” would be “oses,” and it would be all her fault! She added “rainbows” would be “ainbows” and then randomly, but thoughtfully, moved on to all the words that would be different if “p” got its feelings hurt and ran off. 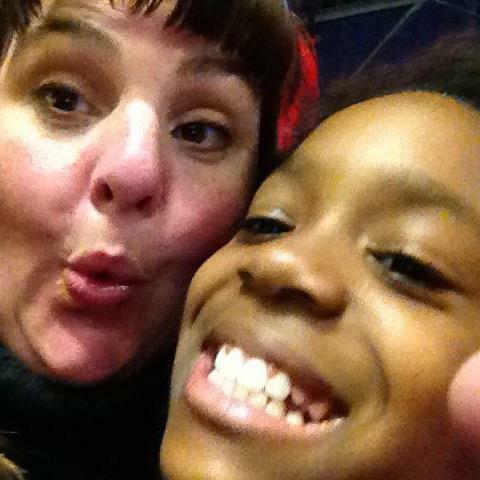 When my oldest adoptive daughter came to me as a then 9-year-old African-American foster child, I remember correcting her pronunciation of “library” the first time. Being a white, educated, 40-year-old woman, correcting her pronunciation was an obvious thing to do, and I didn’t give it a second thought. Within about ten minutes a fellow shopper caught my eye. She was 10 years older than me and African-American. As she was walking past us, I said “Excuse me, ma’am. Could you explain to my daughter how you pronounce the place where one checks out books?” She stared at me for a split second before she understood what I was asking and then calmly looked at my then foster daughter and said. “Yes. It’s the library.” My daughter proceeded to argue with her that it was in fact the “libary” sans the “r.” And this total stranger calmly explained to her, “No, honey. It’s “library” with an “r.” That’s how you say it. “Library.” I thanked her as she walked away. Thank God for total strangers. However, every time I correct their speech, I’m reminded of the dual worlds my children will always balance between, and a small part of me thinks I’m chipping away at them a bit, oppressing some part of their soul that’s tied to a world I can never give them and that may never again be fully within their grasp. And, my world becomes grayer and grayer. It’s a world where “proper” doesn’t ring quite as true as it once did.